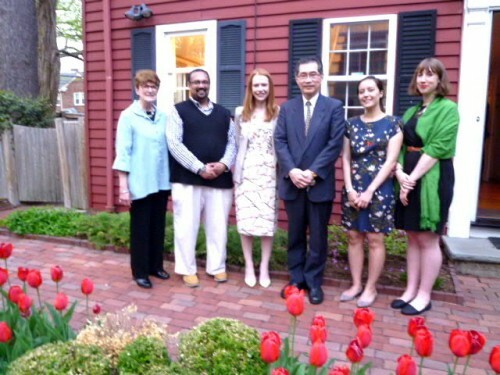 その趣旨はこちらーー＞　Since 1996, the Program on U.S.-Japan Relations has annually awarded a summer research grant to a Harvard doctoral student who conducts social science research on contemporary Japan. Made possible by a generous grant from Akiyama Aiseikan, a pharmaceutical firm based in Hokkaido, the Akiyama Award commemorates the life of Akiyama Aiseikan’s past president, Mrs.Kiyo Akiyama. I hope very much that you have enjoyed the arrival of spring in Hokkaido. It is my great privilege to let you know that Rui Hua, Ph.D. candidate in History and East Asian Languages, has been chosen as the recipient of the 2018 Akiyama Award. His topic is “Sino-Russo-Japanese Collaboration and the (Un-)Making of the Frontier Cultures of Legality in Manchuria, 1900-1957.” His advisors are Vice Provost and Professor Mark Elliott and Professor Andrew Gordon, two distinguished historians at Harvard. Below is the link, which has updated information about the award to Rui Hua, and a website page that has his photo. Rui’s topic is one that is at the forefront of international history, uses archives of multiple languages, and will be a groundbreaking contribution to East Asian historical scholarship. We are most grateful for your continued support for Harvard graduate students engaged in social science research related to Japan. Your support has made a major difference in the lives of Harvard graduate students, and we cannot thank you enough for your generosity. I am truly honored to receive the 2018 Akiyama award, and wish to thank you for the support and encouragement the award has brought to me and my intellectual work. It is my great pleasure to introduce my academic work to you. My dissertation project examines the evolution of Japanese legal culture and its interplay with the Chinese and Russian legal regimes in Manchuria in the 20th century. I explore how law was used as an instrument of empire in the great power rivalry of the colonial period, and how legal sensibilities structured the life-world of the multinational communities of the Japanese borderland. I believe the legal-cultural developments in Manchuria shaped many contemporary ideas - like land rights and territorial resources - that animate political debates in Northeast Asia today, and hope that my work might help us better understand how these concepts acquired their contemporary significance through the shared history of the East Asian peoples. The Akiyama award has inspired me greatly in my study. Your generous support has made it possible for me to pursue my research in much greater depth and breadth, for which I am extremely grateful. I look forward to enjoying the privilege of expressing my gratitude to you in person in the future.